Jerry Sandusky will spend the rest of his life behind bars. Sandusky was sentenced by Judge John Cleland on Tuesday to at least 30 years with no more than 60 years in prison after being labeled a sexually violent predator during a brief hearing at 9 a.m. He'll be credited with 112 days of time already served and was ordered to pay restitution of more than $1,000. Cleland said that although the law would permit him to put Sandusky away for centuries, he chose not to, but make it instead, very clearly, a lifetime sentence. Sandusky will stay in the Centre County Correctional Facility for 10 more days before being transported to Camp Hill. In his red jumpsuit, 'CENTRE COUNTY' stamped across the back, the 68-year-old convicted on June 22 on 45 of 48 counts of sexually abusing 10 boys over a 15-year period made a last-ditch attempt to revive his story of innocence, that he was the victim of a conspiracy to set him up. Addressing the court for the first time, Sandusky's words were similar to the statement he released to Penn State's student-run radio program, ComRadio, on Monday night. His voice, while hoarse, was steady until the end of his speech. "I'm grateful for the opportunity to speak today," Sandusky said. "I feel a need to talk, not from arrogance but from my heart and there's so much that I want to say that I've been advised not to say ... I'm filled with motivation, determination. "I didn't do these alleged disgusting acts," Sandusky said. The former Penn State football defensive coordinator said he hopes for a better day, and although he doesn't know when that day will come, he hopes some of the words he says today will make an impact. "This was the worst loss of my life, but not the first. Please don't close the book today, there's a lot left to learn. "As I began to relive everything – my feelings that so many people were hurt ... It was a horrible time in life to witness, to be a part of. Many moments have been spent looking for a purpose. "Maybe it will help others," Sandusky said. He believes that the tale told over the past year may have prevented other vulnerable children from being abused. "I would hope that it would happen ... I would cherish the opportunity to be a little candle for those, as it goes on, as they have been a huge light for me. Hopefully it can get better in our hearts, they are suffering. "Somehow, someway, something good will come out of this." When he reached the end of his speech, Sandusky became emotional, his voice breaking. His back was turned to media and the public who came to watch his sentencing as he faced the judge, but it sounded like he had started to cry. "Today is a difficult day, I'm being labeled and sentenced. We will continue to hold our heads up to face what we must and to cling to what we have. "We're going to smile because I've always smiled through the pain, and we're going to laugh and we're going to cry." Cleland said Sandusky's manipulation of those people who believed he was someone to trust made his crimes "much, much worse." "It is perhaps the ultimate tragedy that all the qualities that made you so successful continued to conceal the very vices that led to your downfall," Cleland said. "You abused the trust of those who trusted you." "It's the remarkable ability to deceive that makes these crimes so heinous," Cleland said, condemning Sandusky's allegations of conspiracy against him. Turning to the victims, Cleland said they abuse they suffered should not be a source of embarrassment for them because they did nothing wrong. "You should not be ashamed, his conduct was no fault of your own. It is for your courage and not for your assault that you will be remembered," Cleland said. Penn State President Rodney Erickson released a statement via email immediately following the sentencing. "Our thoughts today, as they have been for the last year, go out to the victims of Jerry Sandusky's abuse. While today's sentence cannot erase what has happened, hopefully it will provide comfort to those affected by these horrible events and help them continue down the road to recovery." 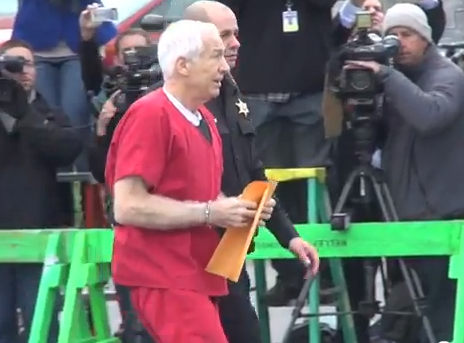 Jerry Sandusky arrived at Centre County Courthouse shortly before 9 a.m. Tuesday for his sentencing. He wore a red jumpsuit and carried a manila folder while handcuffed. He was escorted by one police officer through a covered tunnel upon entering the back of the courthouse.